St. Alphonsus School has an athletics program that is designed to offer opportunities to all students who are interested in participating. Through the Manitoba Catholic Schools Athletic Association, grade seven and eight students can participate in inter-school competition in volleyball, basketball and badminton. 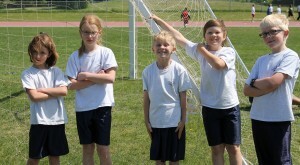 Students from grade 4 and up have the opportunity to join track and field in the spring. We strive to incorporate fair play in all of our athletic activities. Equal playing time, respect for competitors/ officials and good sportspersonship are essential elements to the program. The school also endeavours to provide the opportunity for students less interested in this level of competition to play on teams during intramural activities or through the developmental league. These teams are based on the same fair play principles established for competitive teams but are open to all students who choose to participate. We offer extra-curricular clubs that encourage an active lifestyle including running club, badminton club and other activities as the interest arises.